Office space prices from ៛200751 per month. Converted into co-working space, this was previously a three storey, flat-style house and still has the room, restroom and kitchen configuration of the original structure. Onsite amenities are plentiful, and the space caters hot desk and dedicated co-working options, and virtual office solutions on flexible terms. Close to facilities and services from hotels, restaurants, bars, cafes, retail venues, and financial institutions. Located in the charming Wat Bo Village area, this space welcomes modern nomads from all walks of life. A place where work meets play with co-living options on-site for digital nomads exploring the rich culture of the area. Experience warm temperatures all year round, with the ability to cool down in the on-site pool when you need. Close to a range of amenities including schools and universities, food and beverage facilities and accommodation options, this area is rich in facilities you may find useful in your day-to-day life. 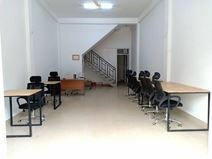 Catering to the work space needs of expats, digital nomads and young urban crowd; come and enjoy some of the best coffees and teas in Siem Reap. A great place for meeting with friends or colleagues, and also meeting new people, networking and exchanging ideas. Local to the heart of Siem Reap and only a block or so away from the river, this centre is a prime location to access a variety restaurants, cafes, eateries, bars and nightlife, hotels and hostels, shops and spas. All of which make it a fantastic option for your permanent and temporary working needs.